A while ago, my parents recommended that I fill up the tank of my 2003 Camry with premium gas every now and then to extend the longevity of the car. With gas prices as low as they’ve been, and considering that I work from home and only have to go to the gas station once every 30-40 days, spending $7 extra a few times a year isn’t a big deal. However, at least according to this article, the vast majority of cars don’t need intermittent “flushes” via premium gas. In fact, for most cars, the improvement in performance is extremely minimal–you’d only notice it if you were an automobile enthusiast. So I’m curious: Do you ever treat your car to a tank of fancy gas? Does it make your car happy? Would you recommend it? This entry was posted on Wednesday, November 30th, 2016 at 11:58 pm	and is filed under technology and tagged with technology. You can follow any responses to this entry through the RSS 2.0 feed. Nope, but I do treat it to non-ethanol gas every now and then. You’ll see a noticeable difference in happy car while you aren’t feeding it corn. Funny you should say that–the last time I gave my car premium, I noticed that the 10% ethanol sticker was only above the premium gas. That seemed odd to me. The middle option didn’t have ethanol, so maybe I’ll try that next time. Unless the station makes a big deal out of it being non-ethanol then it probably all has ethanol in it. 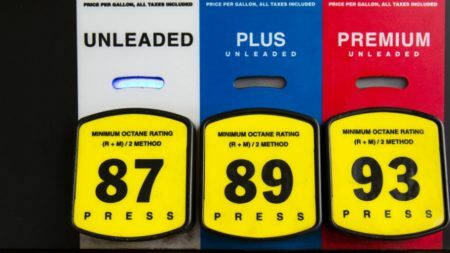 You can expect non-ethanol 87 octane to run you $0.50+/gallon more than ethanol 93 octane. At least that’s roughly what it is around here. Unless maybe winter gas doesn’t have ethanol but I assume it all does. I use safeway rewards, and they give anywhere from ten to thirty cents off the gallon. I’ve used nothing but the fancy stuff for about three years now and I’ve seen my gas mileage improve a bit.